Current status: Legally created, physical works nearly completed. Campaigning for new paths and safer road crossings costs money in postage and copying. Help us do more, so that more paths can be created! 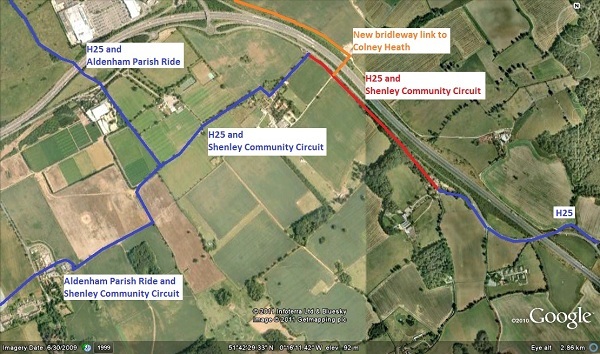 Strategic significance: This path forms part of the H25 London Orbital Bridleroute, and one of the community circuits planned by the Trust and BHS for the area: the Shenley Parish Ride. It is shown in red on the plan: click it to see the route in more detail. 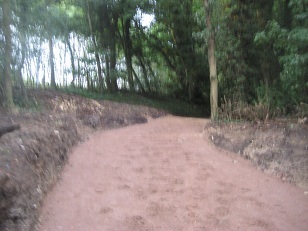 This path was created as part of a planning gain associated with adjacent development works. 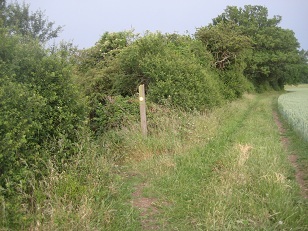 The photographs were taken on 9 Jun 11 and show the view travelling southwards along the route starting at the junction with Shenley 13. 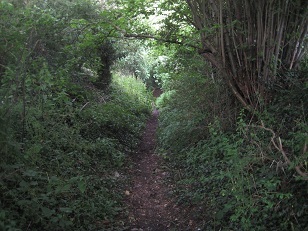 Part of the route was previously available as a permissive path. This is how the British Horse Society reported the opening of that part on 30 May 99. After the opening of the path, Bob Ritson and Sam Gee, the first riders along the route, are greeted by Sue Harrington. The British Horse Society officially opened another section of the London Orbital Bridleroute ('H25') near the old A6 in Hertfordshire today. The route, which is about a third of a mile long, removes all but a hundred yard stretch of the road from a link between a quiet lane and a bridleway. 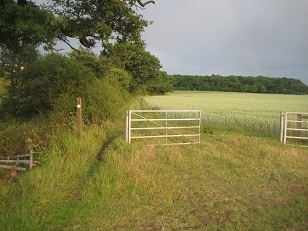 At the opening, Phil Wadey, local Access Officer for the Society, paid tribute to the farmer, Mr Legerton, and the owners, the Trustees of the Tyttenhanger Estate, without whose help the path would not have been possible. Phil added, "There were three deaths of horses on the roads of Hertsmere in 1998 and we are committed to doing all we can to prevent more. It is wonderful that landowners and farmers are helping by setting up off road routes for riders. We have also had assistance from local firms like Gristwood and Toms, who kindly removed a tree that was blocking the route. The community support for off road routes has been excellent. This is a great start to our Riders' Charter Campaign." Thanks for work on clearing the path are due to members of the Patchetts Green Riding Club, the Society, and the North West London Bridleways Association. 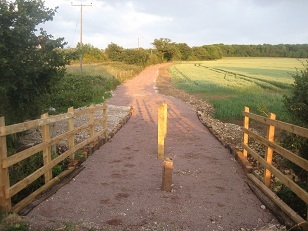 Funding came from the Society's Hertsmere Bridleways Fund and from the Hertfordshire Environment Landfill Partnership. The opening coincided with the first day of the British Horse Society’s Access ’99 week. The week is designed to draw attention to the plight of riders on the roads and the need for more bridleways and other riding routes. After the opening, those present were treated to a barbeque at nearby Wild Farm, courtesy of Mike Burgess, who will be riding the path regularly! Six riders turned out to clear part of a new route from Salisbury Hall to Ridge Hill, near Shenley, which will form part of the Society's planned London Orbital Bridleroute ('H25'). 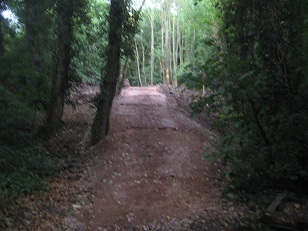 This path will open as soon as the rubbish has beeen cleared and the fallen trees removed. A public bridleway commencing at TL 2018 0263 running generally north west for approximately 320 metres to TL 1995 0286 then continuing generally north west for approximately 200 metres to cross the track leading to Sailsbury Hall and join the B556, Ridge Hill at TL 1982 0301. Continuing generally north west for approximately 170 metres to a junction with Shenley Bridleway 13 at TL 1968 0311.